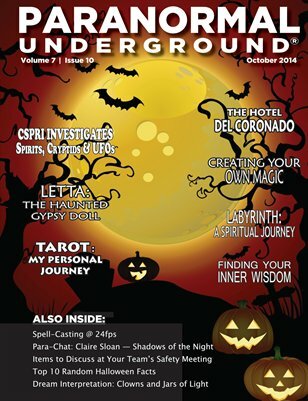 In this issue of Paranormal Underground magazine, we spotlight psychic medium Claire Sloan and the CSPRI investigative team. We also feature the haunted Hotel del Coronado, the alien abduction experience, and Letta the haunted gypsy doll, and Eastern Airlines ghosts. Other columns discuss the paranormal in movies, psychic phenomena, dream interpretation, and metaphysics. We also cover tarot cards, creating your own magic, 10 random Halloween facts, and the Psychic Biker’s journey into mediumship. For a PDF download or 12-month digital subscription to Paranormal Underground magazine, visit www.paranormalunderground.net!